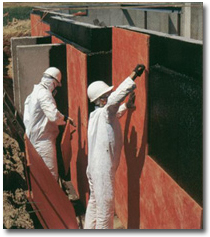 First, we spray apply TUFF-N-DRI®, a seamless waterproofing membrane. Then we install insulating WARM-N-DRI® drainage boards that direct water straight to the drainage system. The performance is superior and the price is about the same as products far less effective. So why go anywhere else? Give us a call. Twin Ports Waterproofing built its reputation around TUFF-N-DRI®. You can feel good about protecting your investment with TUFF-N-DRI®. Click here to view the new Twin Ports Waterproofing commercial.